I had a very interesting conversation with a colleague the other day. She is a teacher in adult education with upwards of 35 years in the classroom and she said to me that the model we recently used in her class and others, with me going directly into the classroom and working with students, makes sense to her. 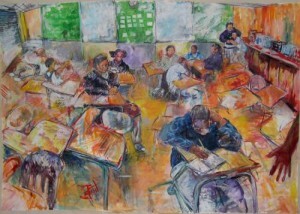 I love this drawing of a classroom. It was done by Todd Berman, a substitute teacher in San Francisco. Click it to go to his website. She said (and these are her words) that she will never know enough about tech to be able to teach her students anything new about tech. She said that it is a waste of time to send her off to do workshops to learn a new technology in the hopes that she would then teach it to her students, and that it is best to show the tech to the students so they can use it within the context of her curriculum and that, if anything, they should be the ones showing her how to use it. a) keeps teachers in the classroom as opposed to sending them out of the classroom for PD. d) fosters student leadership as they learn new tools from a consultant and can show it to each other and their teachers. We went on to talk about how the big work is in creating teachers like her who are willing to let something like that happen in their classrooms. I like that idea – the idea of classroom as a site of professional learning.